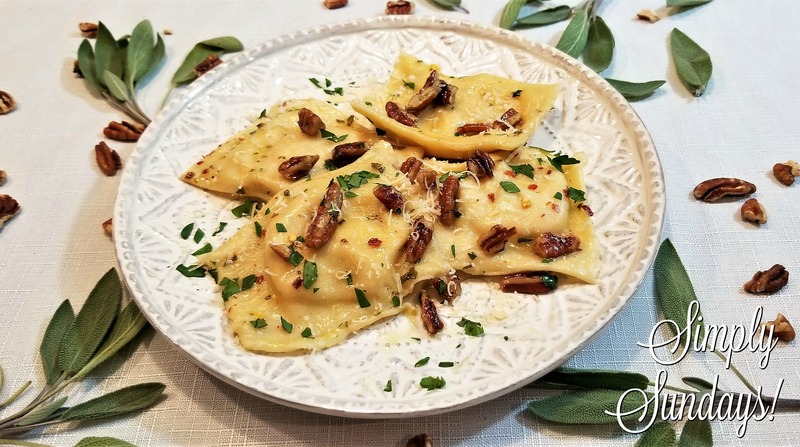 Butternut Squash Ravioli – Simply Sundays! I knew I had to figure this one out for myself! In the end it will all work out! Let the squash cool, in fact you can do this part a whole day ahead along with the next step! It’s time to add the ingredients which will not only make this a ravioli, but will take this to the next level! We kept both so we can now make twenty 2.5 inch raviolis! And what would tie all that together? Place into the oven and cook 20-30 minutes (flipping once in between) or until you can insert a knife easily through the squash and it has a nice golden brown color. Once the squash has cooled, add to a food processor and blend until smooth. Scrape the squash mixture into a bowl. mmm. . . this looks wonderful. I’ve never tried making any raviolis. The wonderful photos make it look like it would be fun to give it a try. It’s really not that hard… just multiple steps. But you could always buy pre-made pasta sheets to cut the pasta making part out. It sounds absolutely delicious and I love how you both got each other the same gift! I’m sure it’s good to have two. This is such an amazing recipe! I love the ravioli molds! I love the kitchenaid attachment! I totally need one! And the pecan butter sage sauce totally brings this recipe to the top! I can’t wait to give this a try! Thank you Beth! The attachment makes it so easy to roll the pasta dough. It’s worth the investment! I’ve ALWAYS wanted to make my own raviolis and butternut squash is my favorite! Just might have to try this one out! It’s broken out into steps which makes it much easier. SO worth it! Let us know if you try it out! My mouth is watering looking at the photos of this recipe! Thank you for all the process pictures. They will really help out when I make this recipe! Thanks for the pictures they are helpful! I can NOT wait to try these. I once had butternut squash ravioli in a restaurant in a teeny tiny restaurant in the middle of nowhere. It was amazing! Beautiful! And helpful pictures as always.